The historic Mujibnagar Day is being observed on Wednesday(today) marking the formation of Bangladesh’s first government that led the War of Liberation in 1971. 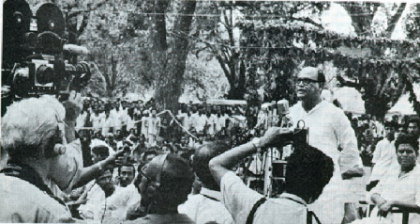 Senior leaders of Awami League assembled at Baidyanathtala, a mango orchard, which was later named as Mujibnagar, in Meherpur district on April 17, 1971 to form the provisional government of independent Bangladesh in the absence of Bangabandhu Sheikh Mujibur Rahman who was arrested and flown to Pakistan after Pakistan military had cracked down on the Bangalees on the night of March 25, 1971. Bangabandhu was declared the first President of the People’s Republic of Bangladesh, while Vice-president Syed Nazrul Islam became the acting president in the absence of Bangabandhu.Tajuddin Ahmad was appointed the first Prime Minister, while Khandoker Moshtaque Ahmed, M Mansur Ali and AHM Quamaruzzaman were named cabinet members. Prime Minister Sheikh Hasina on Wednesday paid tributes to Father of the Nation Bangabandhu Sheikh Mujibur Rahman on the occasion of historic Mujibnagar Day. The Prime Minister paid the homage by placing a wreath at Bangabandhu’s portrait in front of Bangabandhu Memorial Museum at Dhanmondi in the city in the morning. After laying the wreath, she stood there in solemn silence for some time as a mark of profound respect to the memory of Bangabandhu, the architect of the country’s independence. Flanked by central leaders of her party, Sheikh Hasina, also the President of Bangladesh Awami League, placed another wreath at the portrait of Bangabandhu on behalf of her party. Later, the leaders of AL’s associate bodies, including Jubo League, Chhatra League, Mohila Awami League, Jubo Mohila League, Swechchhasebak League, Sramik League and Krishak League laid wreaths at the portrait of Bangabandhu.President Abdul Hamid and Prime Minister Sheikh Hasina issued separate messages on the occasion. In her message, the Prime Minister urged the people of the country to engage themselves in building Bangladesh to make it free from hunger, poverty and illiteracy as dreamt by Bangabandhu. Awami League and different socioeconomic organisations have chalked out elaborate programmes on the occasion.